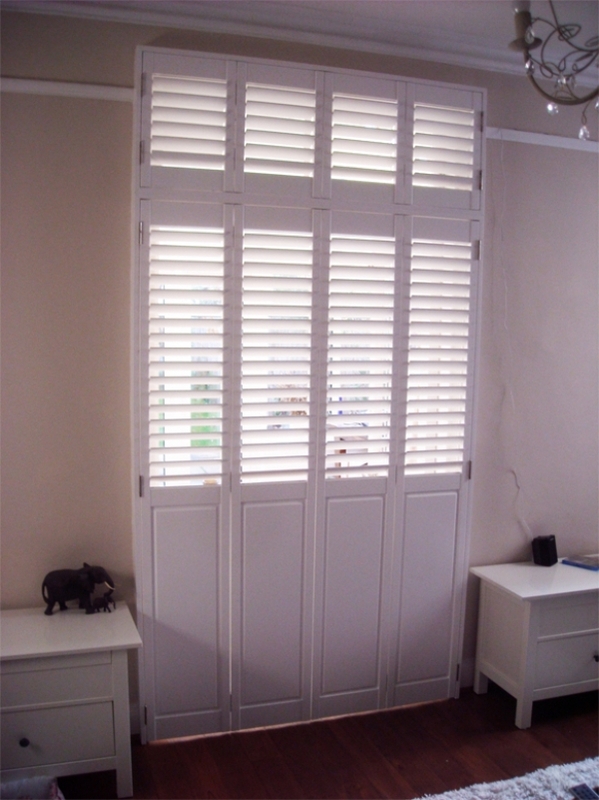 Interior shutters are not always used in windows, they are used sometimes as wardrobe doors, or as French Door coverings, or here you can see that they have been used as a room divide between two rooms. On very tall shutters like this, there is scope to have a bit of a play around with the design. These Room Divide Shutters have been manufactured with half of the panel solid from the bottom up to a mid point on the shutter, and half louvered shutters from the mid point up to the top. Many properties decide to open up rooms with a large opening between them, but it’s always nice to have the option to separate the rooms when you need to.By choosing half solid shutters and half slatted shutters you get the feeling of a wall which increases the feeling of a room separate from the one it is joined on to. Interior window shutters which are hinged together will concertina on to one another when they are opened up. The panels will fold back against one another and will either lie against the recess or flat against the wall depending on where the frame is installed, this will create a nice wide opening when you require the rooms which are joined together to seem as one. Perfect for entertaining!